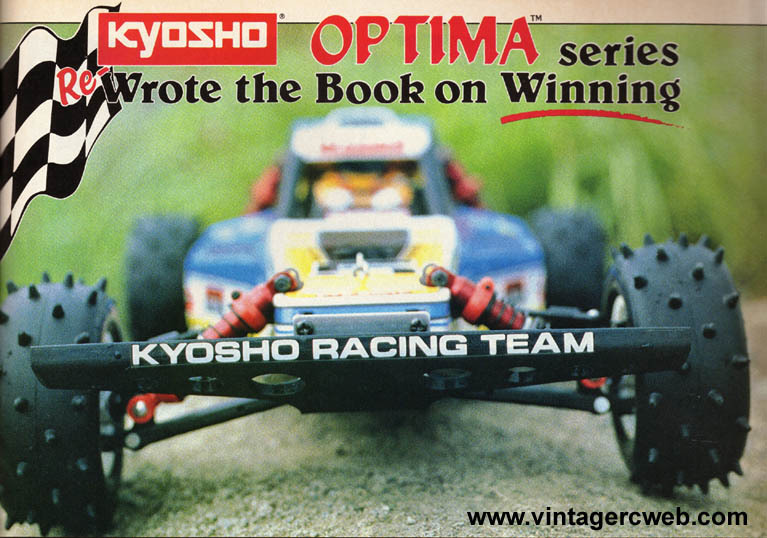 The Kyosho Optima line was probably the most successful kit series that Kyosho had ever produced. This model was the first of a long line of variations that spanned almost a decade. 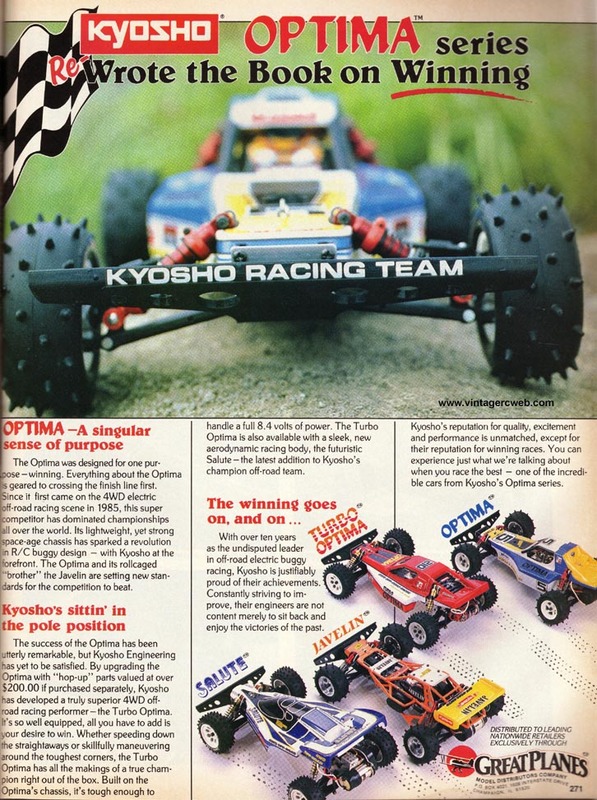 Kyosho had produced several four-wheel drive buggies over the years with only limited distribution and success. They got this one right! The Optima debuted near the end of 1985. 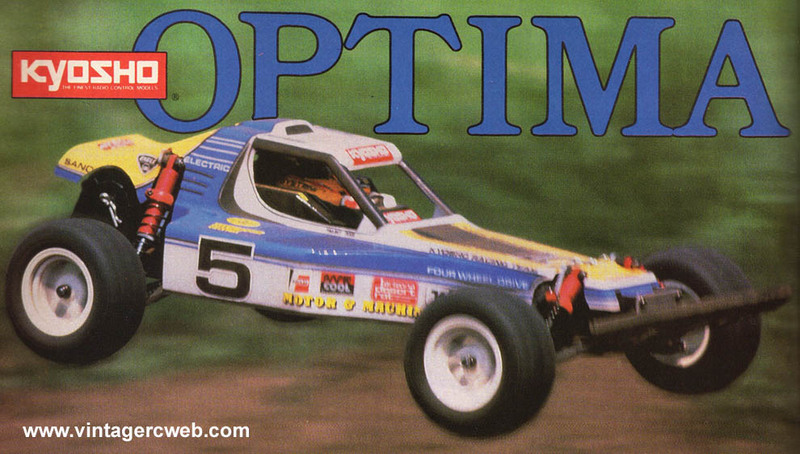 After its release, this buggy began eating up its competition at tracks all over the world. This design truly made people rethink their decisions to go with the two-wheel drive configurations that had dominated racing since the very beginning. 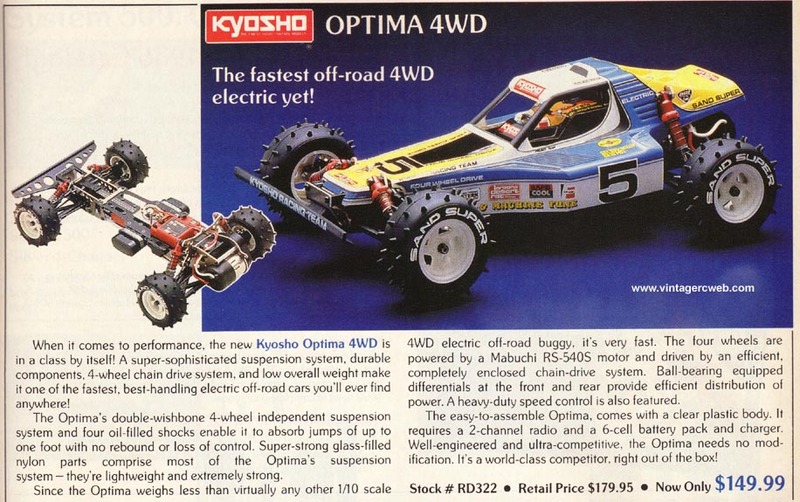 Kyosho also began a huge push of hop up parts from its racing division line, Option House. 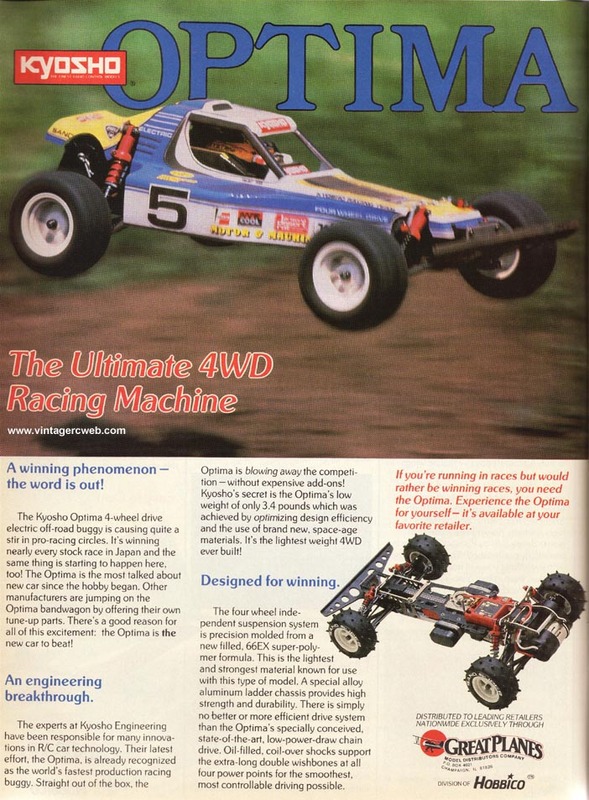 These kits were well thought out and even though these buggies were quite complex, the instruction manual made it possible for a young novice to get it right. As with most vintage metal kits, Locktite was a must especially on the set (grub) screws on the drive train and suspension. The Optima also had its share of bugs in its design. The first bug that would rear its ugly head was the problematic chain drive. Although this same hook link design had been used on several buggies, this was the first to be fully enclosed. When the chain began to stretch and links became bent the smooth operation of the drive train would be lost. The only access to this chain was a small window on the top radio tray. This was quickly remedied with the introduction of the Option House belt drive system. 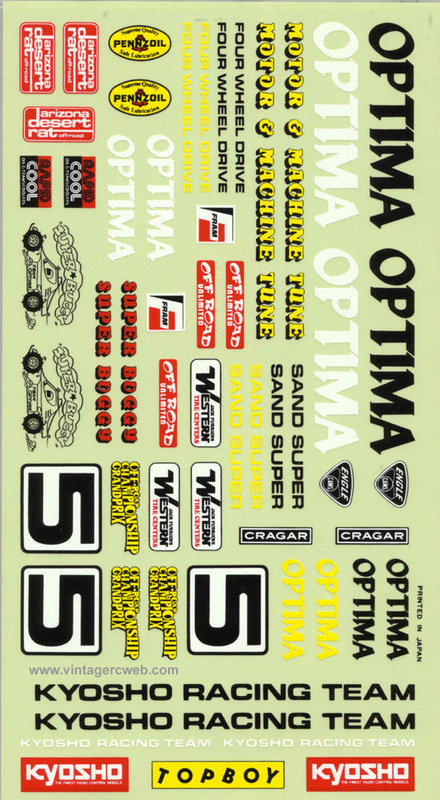 This made the Optima much quieter and more fun to race. The Optima was also quite vulnerable to front-end damage during a crash. The bumper was connected to the same plate that was used to keep tension on the drive chain. When you bashed into a solid object, the bumper would push the entire front-end back and the chain would then have entirely too much slack and then it would jam. Finding one with an intact front-end brace is very difficult. The steering servo configuration is also something that would plague the Optima series though its entire run. This servo was mounted inside the box frame chassis on its side fastened by a piece of double sided tape. Once the model began to get dirty and gritty the tape would allow the servo to swivel until a straight line was the only direction you could go. Zip ties and changing tape frequently seem to be the only real fix to this issue.